Babaji excerpt: The next day, I went into the temple with everybody else for morning aarati. I went up to the Murti and made my pranam (put hands together and bow). Then it happened -–- BANG! Babaji hit me in the third eye with a giant gold OM sign, just like the one I'd seen on His forehead in my dream. I nearly fell over backwards. I was in shock. All I could feel Him saying is, "I am real, I am Babaji." Another day, when I was just falling asleep at siesta time, Babaji lifted my eyelid gently and peered right into my being with His piercing eyes. He was saying, "Wake up, keep alert!" I felt like He was protecting and watching over me, too. The rest of the trip was very profound, but not without its dramas. The day we all visited Babaji's cave on the goofa side of the ashram, where the nine temples are across from the Gautama Ganga River, we all gathered, as there was an announcement to be made by Sondra Ray, our leader. She said, "I don't want to alarm, you, but I think you should all know this. A pneumonic plague has broken out, and it is airborne. We are all safe here in the ashram. It has only reached certain areas, so far." Well, that was it; everybody's worst nightmares about getting sick in India had just gathered to a frenzy! A real test of faith sent to try us. A few days later, as scheduled, we left for the nine day Navratri Divine Mother Festival in the northern ashram. Truth:-The truth is god's eternal law. The truth starts with your thoughts-–-body mind and spirit. The mind controls everything, therefore a balance of harmony within the individual is required for the expression of truth. Simplicity:-Simplicity means living a simple, comfortable life, detached from the material world. This does not mean complete renunciation of necessary things or giving up an active role. Love:-Love is the essence of all things: "love is god, and god is love" Requires a sense of unity and harmony with the universe and with oneself. If you are in alignment with the eternal law, you are living your truth. Babaji said "I don't want you to talk about truth, simplicity and love, I want you to live it!" Human pain and suffering are created by our ignorance and separation from the eternal law. 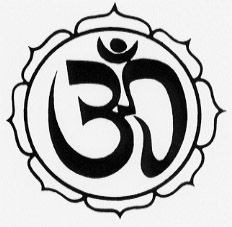 The way to heal this is through purification techniques and discipline and chanting the mantra "om namah Shivaya". MY EXPERIENCE WITH BABAJI: After some intense breathing, I had an amazing vision. Suddenly, this ball of golden light entered my body, and I felt waves of incredible, pure love come through me. I then released all the core grief and sadness that I had held onto in my body,immortal being, author of the books AGELESS LIVING and LIFE UNLIMITED. Creator of ENERGETIC BALANCING. 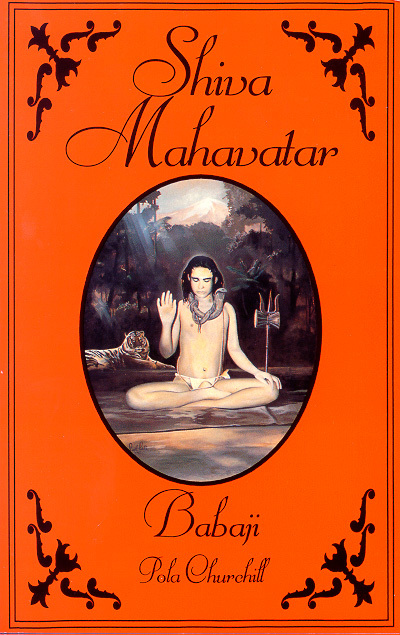 SHIVA MAHAVATAR BABAJI by Pola Churchill is one of the most popular books in our Maha Lakshmi Shop at the Ashram. The stories of Babaji are riviting and the book also includes His teachings which are so timely and important in this age. His primary teachings were to be good human beings, live lives of truth,simplicity, love, and to serve others while keeping the name of the Divine in your heart and mind. The book is concise, but full of many important things and worthy of every one's reading." RAMLOTI, President of the Haidakhandi Universal Ashram- Colorado. "Pola Churchill's beautiful book on Babaji is insightful, sincere, and inspiring. A must read for sanyone on the spiritual path." FRANC TAUSCH, Phd. Actor and TV. Host. - Beverly HIlls, Ca. "A very simple and beautifully written book about Mahavatar Babaji. The dreams and visions stories are inspiring, and then photographs of Babaji transmit a strong energy." REV JAMES SIA - Los Angeles Ca. 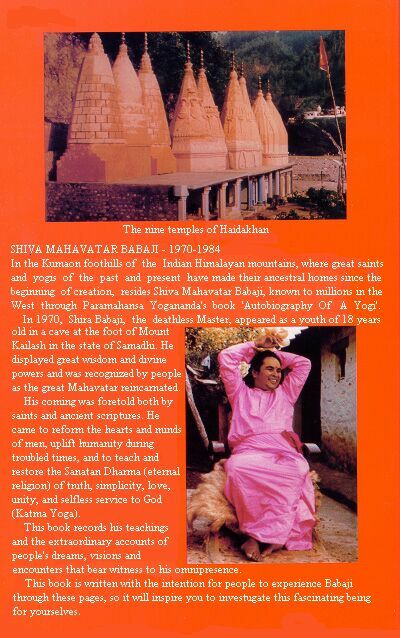 "The book Shiva Mahavatar Babaji" radiates the Devotion and Faith of the devotee." TARA CHANDRA NATH, Babaji devotee - Sedona, AZ. "There is beautiful "light" flowing from the writing style and content of this book. It touches the soul." CLAUDE CHARLBOIS - photographer - Canada. e most popular books in our Maha Lakshmi Shop at the Ashram. The stories of Babaji are riviting and the book also includes His teachings which are so timely and important in this age. His primary teachings were to be good human beings, live lives of truth,simplicity, love, and to serve others while keeping the name of the Divine in your heart and mind. The book is concise, but full of many important things and worthy of every one's reading."